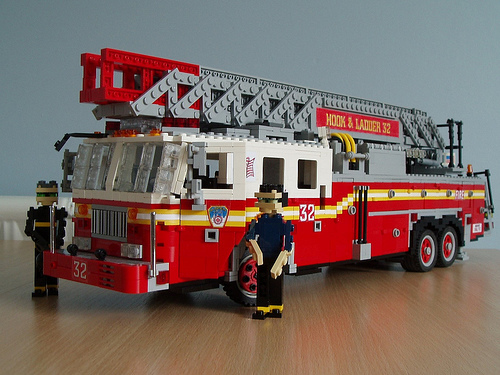 For the November LUGnuts Fear and Loathing challenge, Ralph Savelsberg faces his fear of fire, heights, and loud noises with this FDNY (Fire Department, City of New York) ladder truck. The ladder itself extends, and the truck is covered in Ralph’s signature stickers. See more of Ralph’s fire engines in his Fire photoset on Flickr. And on top of everything else it’s remote controlled via LEGO’s Power Function system. A truly awesome build. yes, a truly awesome build! Damn, Ralph! (I keep saying that!) Another brilliant build. Oh yes, with power functions and iconic Ralph styling this firetruck has it all!